Persistence Market Research uses a unique research methodology which is a strong blend of secondary and in-depth primary research. Extensive primary interviews with key market players, stakeholders, market observers and experts are carried out to collect necessary data and information pertaining to various segments and across key regions. The data crunching and statistical analysis so performed undergoes multiple layers of validation to garner appropriate market insights which could benefit business by impacting critical decisions. The exhaustive research methodology has been applied to thoroughly understand and study the market for tissue processing systems and the findings and insights have been skilfully crafted following a systematic structure in the new report titled “Tissue Processing Systems Market: Global Industry Analysis (2012-2016) and Forecast (2017-2025)”. The market research report on global tissue processing systems is an extensive market research study that focuses on the global market scenario and provides actionable insights on various aspects that have an influence on the growth of the market. It delivers an unbiased view of the market by including analysis on various market segments across the major geographies of North America, Latin America, Europe, Asia Pacific and Middle East and Africa (MEA). The global research report on tissue processing systems market has in-depth weightage on statistics, figures, numbers and graphs that is based on a clear market definition. This will enable the reader to take informed decisions with the help of well-furnished insights. The upcoming trends and developments, new innovations in products and varying product portfolios, new acquisitions, end user analysis and much more actionable acumen give a 3600 view to the market ultimately providing the reader with necessary tools to devise strategies in order to establish firm grip in a particular region or in a particular segment in the global tissue processing systems market. 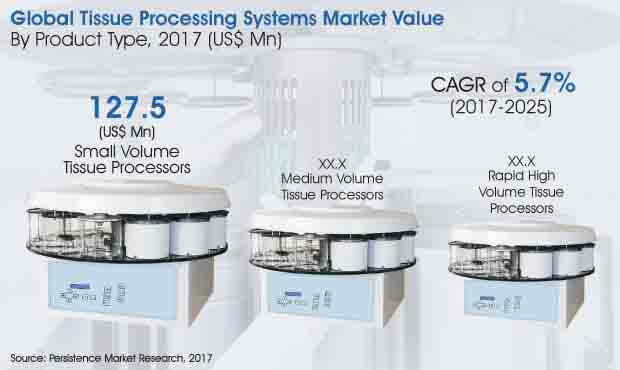 The global tissue processing systems market research report includes competitive scenario that covers the revenues, market shares, growth strategies, product portfolio assessment, expansion in several geographies, distribution channels, SWOT analysis, marketing strategies, pricing analysis, etc., of the various key companies participating in the global tissue processing systems market. Such an intelligence framework can be used to devise suitable strategies with a view to gain competitive advantage in the long run. This section can support upcoming businesses to formulate tactics to start gaining hold in the tissue processing systems market. According to Persistence Market Research, the global tissue processing systems market is anticipated to witness significant market valuation by the end of the year of assessment. During the 2017-2025 timeline, the global market is expected to exhibit a healthy growth rate owing to increase in adoption of tissue processing systems across regions worldwide. In 2017, the global tissue processing systems market was worth around US$ 280 Mn and is expected to reach a valuation of more than US$ 400 Mn by the end of the assessment year (2025). This growth can be attributed to the rise in prevalence of cancer, advancements in technology and rise in lifestyle diseases and geriatric population across the globe. The emerging economies of the Asia Pacific and MEA regions are expected to offer lucrative opportunities for tissue processing system manufacturers owing to the rapid changes in healthcare reforms and the disproportionately growing aging population. For instance, the United Nations report states that two third of the global older population resides in the developing nations and the number is growing at a faster pace compared to developed regions. It projects that the geriatric population in the less developed regions is projected to grow by 71% between 2015 and 2030. This growth in geriatric population will increase the patient population in the region that would be needing screening and diagnosis for a large number of chronic diseases. Moreover, the healthcare spending in emerging markets continues to increase with their economic growth and hence they are expected to become major markets for medical device manufacturers. For instance, the World Economic Forum 2014 report estimates that almost one-third of the global health expenditure will be utilized in emerging markets by 2022. There is a huge market potential in the developing and under-developed markets as the governments are focused on improving the healthcare spending and infrastructure to offer affordable advanced health care solutions to the growing patient population in these regions. Small volume tissue processors segment in the product type category is expected to incur high revenue by the end of the assessment period. This segment is poised to expand at a CAGR of 4.4% during the period of forecast, 2017-2025. It is estimated to be valued at around US$ 180 Mn by the end of the year of assessment (2025) from a market valuation of US$ 127.5 Mn in 2017. In 2017, this segment led the global market in terms of market revenue and is likely to retain its status quo by the end of the year of assessment. Medium volume tissue processors segment is expected to grow at a comparatively high CAGR of 6.3% throughout the period of forecast. This segment is valued at around US$ 89 Mn in 2017 and is anticipated to reach a significant valuation by the end of the forecast period. It is also the second largest segment from a market share perspective.